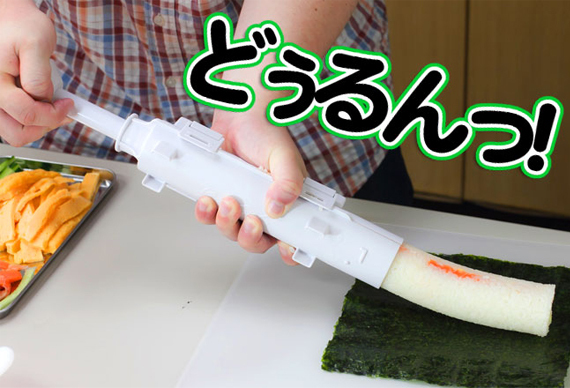 Despite how it sounds, the Sushi Bazooka is NOT a device that shoots sushi rolls at your face at high speeds. (I know, I was disappointed too.) It is however a really easy way to make sushi. So while master sushi chefs spend years perfecting their art, you can shove some rice and fish in a tube and roll out some sushi rolls on the quick. Sure, they may not look as pretty, and they probably won’t even taste as good, but this is America dammit. We demand food that’s fast, cheap, and abundant. And if you’re weary of purchasing such a gimmicky product, don’t worry! According to the product page English instructions are included AND it was tested with real food. Where can we buy this in The Netherlands?